According to appraiser David Smith, AMCs just need to be told to do their job. “When an AMC receives a request from a lender for more information, BANG, it is immediately forwarded to the appraiser for correction without the AMC reviewing the legitimacy of the lender’s request,” says Smith (not his real name). 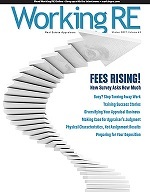 “I often wonder if appraisers realize the function of an appraisal management company. These companies continue to eat into the revenues of appraisers while professing to provide a valuable service to lenders by improving the quality of the reports. Yet, they are far from providing this service. The lack of responsibility by AMCs to truly manage the process is also a failure to provide the appraiser with independence as required by law,” says Smith.